Easy Pumpkin Bread tastes so flavorful and is super easy to make from scratch! 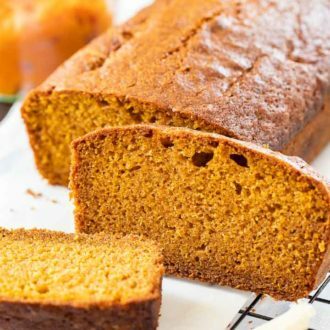 This simple spiced Pumpkin quick bread is so moist and tastes even better than the one you can get at Starbucks. A family favorite that kids and grown-ups will love! Preheat oven to 350° F (175° C). Grease two 8-1/2x4-1/2-inch loaf pans and line them with a strip of parchment paper leaving an overhang on both long sides. In a large bowl, combine flour, baking soda, baking powder nutmeg, cinnamon, cloves, and salt. In the bowl of a stand mixer or using a large bowl and a hand mixer, combine eggs, white sugar, brown sugar, and vanilla extract. Mix on medium-high speed until combined, about 45 seconds. Add in pumpkin and vegetable oil and mix until combined, about 20 seconds. Add flour mixture to the bowl and mix until batter is just blended and smooth. Divide batter between the prepared loaf pans. Bake for about 50-60 minutes or until the top is nicely browned and a toothpick inserted into the center comes out clean. Let cool in the pan, about 30 minutes. Then invert onto a cooling rack and let cool completely.